They say that "Every Love Story Is Beautiful, But Ours Is My Favorite!" This VW Bus is ready to take you on your life-long love adventure! 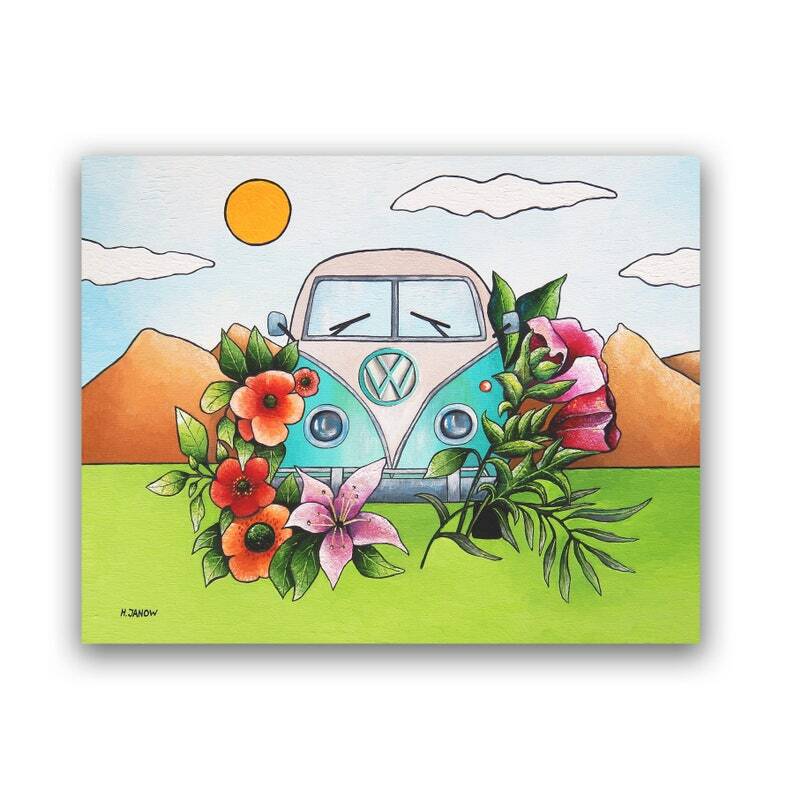 The vibrant, happy colors of this original, one of a kind acrylic painting “Love Bus” make this artwork a great choice for any room in your home! Try it on a blank wall above the table or couch or hang it in the entryway to grab your guests' attention! Unique, original gift for any occasion! Great Kids Room Decor as well! - Created on a stretched canvas using my unique acrylic painting technique! - Wired, ready to hang right out of the package! - Sides are painted in black - no frame required! - Certificate of Authenticity is included, signed and dated by me, the artist. I create unique, high quality art for your home! Full of life and vivid colors, my whimsical original paintings and giclee art prints will bring a smile to your walls and soul! My aim is to inspire others, share my love of nature through art and capture everyone's imagination. I am always in awe with nature’s extraordinary creative force, spirituality and beauty! My art is highly collectible due to its unique painting technique and recognizable style. © Copyright 2019. Helen Janow Miqueo. All rights reserved. The image of this artwork and the artwork itself cannot be copied, altered, or distributed in any form. Any derivatives, attempted imitation of artwork, duplication/editing of photos is expressly forbidden under Copyright Laws. So happy to buy from Helen again. She packs her artwork in protective padding, so that you can be assured of it arriving safely. Her artistic style is refreshing and unique. Great transaction. This unique print has a bold style and plenty of charm. Very pleased! Absolutely adorable! Arrived quickly and very well packaged. Thank you! I chose this piece for my office to go with the Elder Pride Safe Space theme the LGBT Health Resource Center of Chase Brexton Health Care has made public. It will hang behind my desk so Elders of the LGBT community can see it when the come through the office door. I will be happy to gift wrap it for you and/or add a greeting FREE of charge as a complimentary service. Please place your request in the "Note to Seller" with details after purchasing. Ready to ship orders are shipped professionally packed within 1-3 business days after receiving your payment. Orders placed on Friday will be shipped the following Monday. This time frame is not applicable for custom orders. Please note that Holidays may affect this schedule. All sizes for original paintings and prints are listed in the item descriptions. The largest art prints size I can print is 13x18 inches. I can print custom sizes up to 13x18 inches. Sizes of original paintings vary. I ship primarily to the USA and Canada, however I am happy to ship to other countries with the understanding that customers are responsible for all duties and tariffs associated with their country. If you do not see your country listed under Shipping, please let me know and I will add it for you to purchase. I will also provide you with an estimated shipping cost. Artwork is photographed to represent original artwork colors, however due to individual monitor settings, colors may vary slightly from computer to computer and in person. I will be happy to answer all your color-related questions.